Espresso offers mechanisms to scroll to or act on a particular item for two types of lists: adapter views and recycler views. When dealing with lists, especially those created with a RecyclerView or an AdapterView object, the view that you’re interested in might not even be on the screen because only a small number of children are displayed and are recycled as you scroll. The scrollTo() method can’t be used in this case because it requires an existing view. Instead of using the onView() method, start your search with onData() and provide a matcher against the data that is backing the view you’d like to match. Espresso will do all the work of finding the row in the Adapter object and making the item visible in the viewport. The activity below contains a ListView, which is backed by a SimpleAdapter that holds data for each row in a Map<String, Object> object. Note that Espresso scrolls through the list automatically as needed. Let’s take apart the Matcher<Object> inside onData(). The is(instanceOf(Map.class)) method narrows the search to any item of the AdapterView, which is backed by a Map object. For the full code of this test, take a look at the testClickOnItem50() method within the AdapterViewTest class and this custom LongListMatchers matcher on GitHub. Note: This sample uses the withItemContent() matcher from the sample above. Take a look at the testClickOnSpecificChildOfRow60() method in the AdapterViewTest class on GitHub. 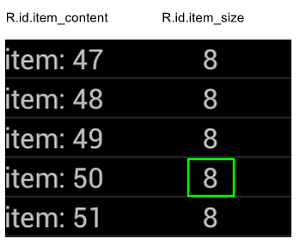 RecyclerView objects work differently than AdapterView objects, so onData() cannot be used to interact with them. scrollTo() - Scrolls to the matched View. scrollToHolder() - Scrolls to the matched View Holder. scrollToPosition() - Scrolls to a specific position. actionOnHolderItem() - Performs a View Action on a matched View Holder. actionOnItem() - Performs a View Action on a matched View. actionOnItemAtPosition() - Performs a ViewAction on a view at a specific position. // First, scroll to the position that needs to be matched and click on it. // Match the text in an item below the fold and check that it's displayed. // First, scroll to the view holder using the isInTheMiddle() matcher. 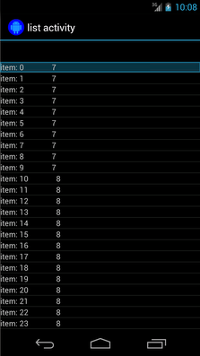 // Check that the item has the special text. For more information about using Espresso lists in Android tests, consult the following resources.